Dr Kyaw and his mobile clinic give displaced women in Kachin access to maternal health care, contraceptives, and gynaecological check-ups. When Dr Kyaw Linn Htun arrives at the Thar Ga Ya camp for displaced people on a Tuesday morning, almost 20 women are already lined up to see him. They fled their homes four years ago when the armed conflict in Myanmar’s Kachine State reached their villages. They have been living in camps ever since. Dr Kyaw and his reproductive health team, which also includes a midwife and a nurse, come to the Thar Ga Ya camp once a month. They are one of two mobile clinic teams that cover 18 camps and 40 villages in the Waingmaw area. Mothers visit the clinic for antenatal, postnatal and newborn care. Women from all walks of life come for contraceptives and gynaecological problems. When the staff spot serious complications, they refer patients to specialist care at the nearest hospital. If a woman cannot afford to go to hospital, the mobile clinics help fund her hospital visit. Today, before opening up the clinic, Dr Kyaw invites the camp residents to an information session about basic personal hygiene. “Poor personal hygiene spreads disease, and so good personal hygiene a simple way to prevent illness and infection. It is not always easy for people to maintain good personal hygiene in cramped and crude living conditions, but I try to show them ways to maintain basic cleanliness even in in their difficult situation. I also try to motivate them to do so by explaining why it is important, and how it can improve their own and their family’s health”, says Dr Kyaw. Women have specific hygiene needs, not least during pregnancy, childbirth and menstruation. But the combination of displacement and poverty means that many women in the camps cannot afford the hygiene products they need for themselves and their babies to stay clean and healthy. The mobile clinic provides care and information, but also supplies such as sanitary napkins, as well as clean delivery kits for women who give birth at home. "I hope to give birth in a hospital"
One of the first women in line for the mobile clinic this Tuesday morning is 19 year old Ei Ngae. 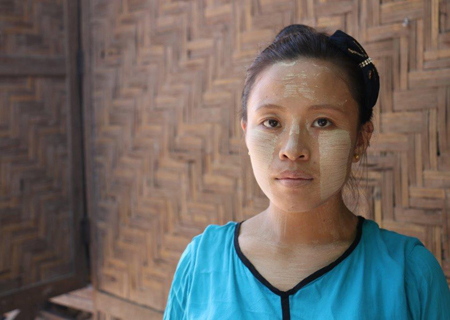 She was 15 years old when the war reached her home in the village Ta Bat Yan. She knew the fighting was near and hoped her village would be spared, as it had been before. But not this time. When bullets started flying between the houses, her mother took her hand and shouted: “Run, Ei Ngae, run into the forest!” Ei Ngae ran, and she has not been back to her village again. “First I put my life on hold, hoping we would return to our village soon. But as time went on, I realized my life must continue, even if I live in a camp. I am married now. I don’t have a job, but my husband earns some money from polishing amber. This is one of the few ways to earn an income in the camp. He never makes more than 50,000 kyats (US$40) per month. It’s not enough, but somehow we manage. We share a room in a long-house with my brother and sister”, says Ei Ngae. She is now pregnant with her first child, and she has come to the mobile for a check-up. Dr Kyaw examines her belly and listens to the baby’s heart. Ei Ngae is apprehensive during the examination, but when Dr Kyaw tells her that both she and the baby are healthy, she breaks in to a smile. A brief smile. She says she is wary of being too happy. She says she keeps her hopes small. She says she hopes she will give birth in a hospital. The mobile reproductive health clinics in Myanmar’s Kachin State are funded by UNFPA and are operated by the Myanmar Medical Association. Gender equality means equal rights and equal opportunites for women and men.